Miss Moneypenny, later assigned the first names of Eve or Jane, is a fictional character in the James Bond novels and films. She is secretary to M, who is Bond's superior officer and head of the British Secret Service (MI-6). Although she has a small part in most of the films, it is always highlighted by the underscored romantic tension between her and Bond (something that is virtually non-existent in Ian Fleming's novels, though is somewhat more apparent in the Bond novels by John Gardner and Raymond Benson). On that note, she is not always considered to be a Bond girl, having never had anything more than a professional relationship with Bond. 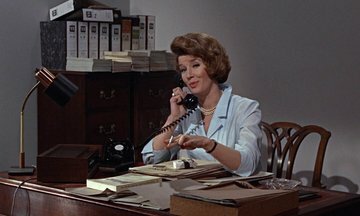 Moneypenny has been played by six actresses in the Bond films—four in the Eon film series, plus two in the non-Eon films.